Ever since I made those yarn bobbles last year, I have been looking for places to hang tassels (did you see my Christmas tree?) 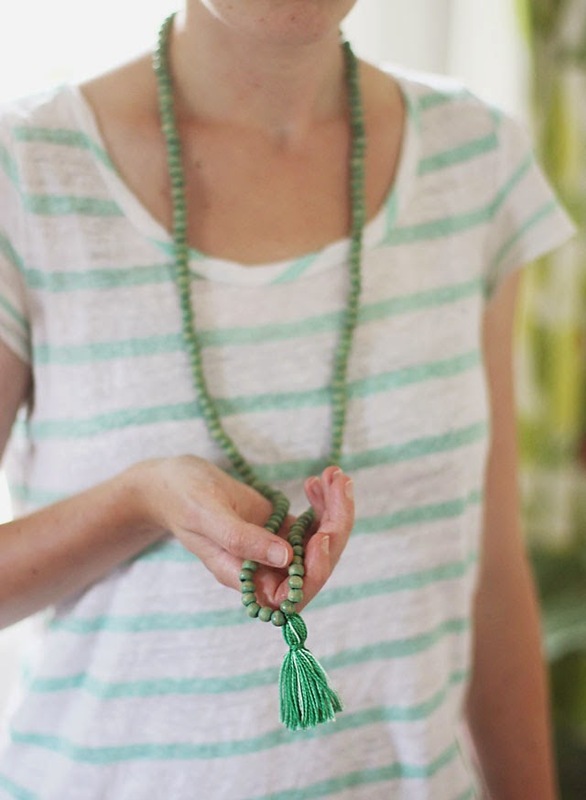 When the folks at Etsy approached me about sharing a mega tassel tutorial, I was keen to do it. I don’t have an Etsy shop myself, but many of my friends (and readers!) do. I have found a number of new, independent, affordable artists selling their stuff on Etsy and have always been delighted with the work. Also, it’s quite the community! They published my tutorial yesterday and I can’t remember a time I have seen so many positive comments. Not just on my work – anywhere. Etsy folks are out to support each other. I’m so glad they asked me to share in the fun. I hope you will pop over and check out their blog for yourself. Oodles of tremendous ideas over there! Have an old market bag that needs a pick-me-up? Get your tassel on! Some time ago I discovered that my cat is a genius and understands how to knock on doors. Let me repeat: KNOCK ON DOORS. There are grownass human teenagers who don’t know how to knock on doors, but my cat, Lola, is doing it without any help or instruction. How on earth that shelter allowed a doo- knocking cat genius like Lola to slip through their fingers I’ll never know, but their loss is my gain! One of these I’ll capture her talents on video, but you’ll have to trust me, it’s a thing of wonder. Also. It’s really cute. She seems to also enjoy playing with the yarn tassel knob bobbles I made a few months back, especially the one with a bell. Last week I was at the dollar store and saw these jingle bell door knob thingies and decided she needed it – instead of knocking on doors, she can jingle them. Good news – I’m pretty confident Lola is going to love to jingle year round. Bad news – the door jungle thing is profoundly ugly. That’s gotta be addressed ASAP. It’s pretty easy — you just slip a strand of yarn half way up the braid before attaching it to the bracelet. Then knot off and repeat. If you are interested in making one, check out the original knob bobble tutorial first. Ways in Which Tassels are Rad by Aunt Peaches. 1. Tassels look very cool. 2. Your cat will think they are toys. 3. Tassels make your outfit look ethnic and bohemian enough to be interesting, but not so ethnic and bohemian you look like you work at the Renaissance Faire. 4. Tassles are Pom-Pom’s big sister, so that’s pretty neat. 5. Tassels look good on doorknobs. 6. 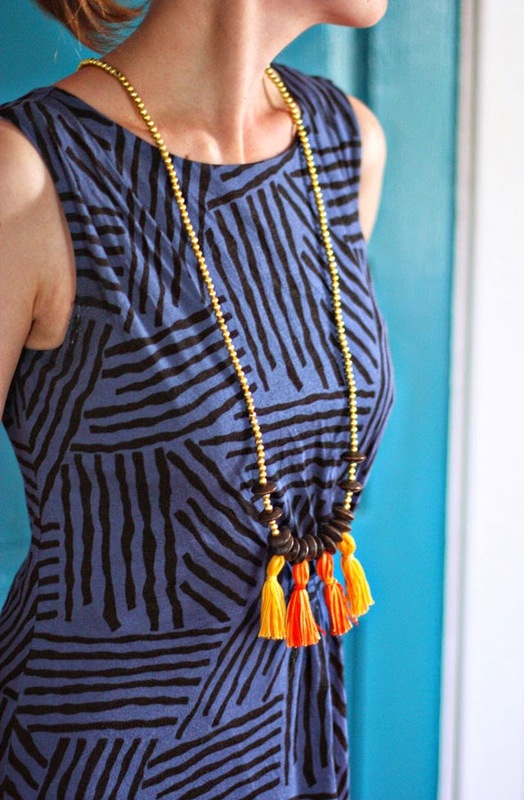 Tassels are easy to make. Even for kids. Or people who say they are “all thumbs.” Because people with hands full of thumbs deserve cute jewelry too. ….actually, not the end. Actually there is a lot more. This is a huge post. Keep going! That thing took five minutes to make. No, really. Five. This one took a bit longer. Maybe 20 minutes. Half an episode of True Blood. That means I got a cool necklace in half the time it took to kill a vampire. Epic winning. When Blitsy contacted me about making something featuring their awesome craft supplies, I thought this one was a no-brainer. Literally, you don’t have to think about it. You just get some embroidery floss and go to town. The secret here is the embroidery floss. You buy it in these teensy candy colored bundles. Or, if you are like me, you buy it in a not-so-teensy jumbo pack and supply yourself for a year of tassel making (listen, I don’t mess around. Christmas is coming and the tassel situation is about to get real). I’m going to split the instructions on this depending of how custom you want to make it. Let’s start with level one; a jumbo two tone tassel of goodness. 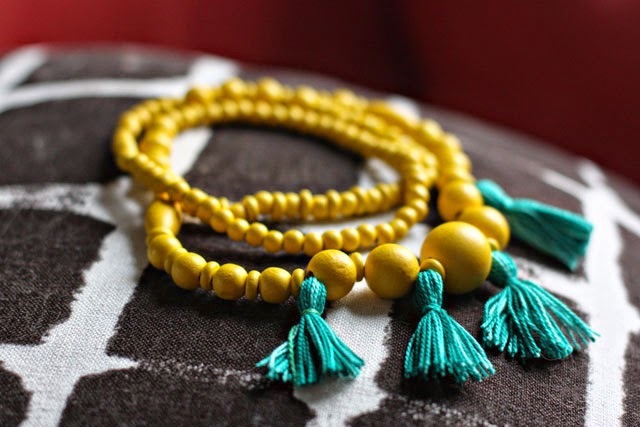 Two loops of embroidery floss and a plain bead necklace (salvaged from the back of your jewelry box, or make one custom), and your sharpest pair of scissors. Now let’s get started! Tie the two floss loops of floss together in the exact center. Fold over, then use the knot strings to attach it to the necklace with another knot. Bring those knot strings back into the rest of the floss, and use a new 6″ piece of floss to wrap around the entire bundle tightly. Tie a double knot, then trim off the bottom as long or as short as you see fit. Presto! Here is another version in green. I cut it a little shorter to keep it nice and neat. It goes with everything. Jeans. Pajamas. Ballgowns. Hospital robes. Everything. 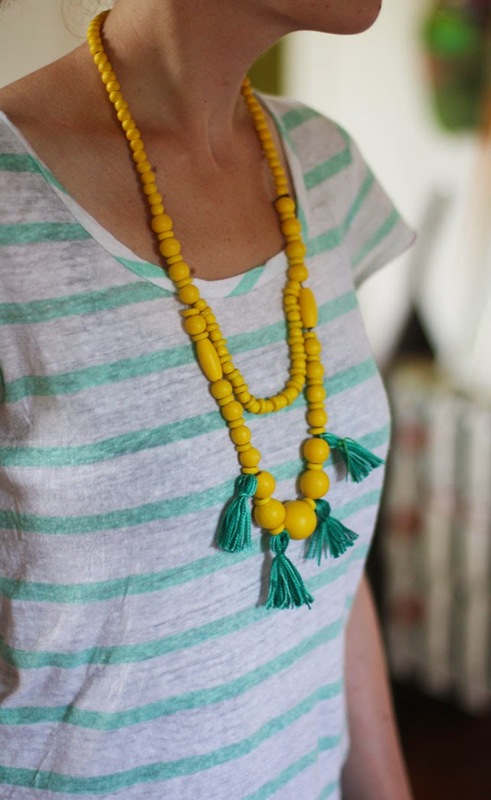 And here is a version using super small tassels attached to a ready made yellow necklace. I hadn’t worn that thing in ages, now I’v worn it twice this week. That’s the power of tassels! 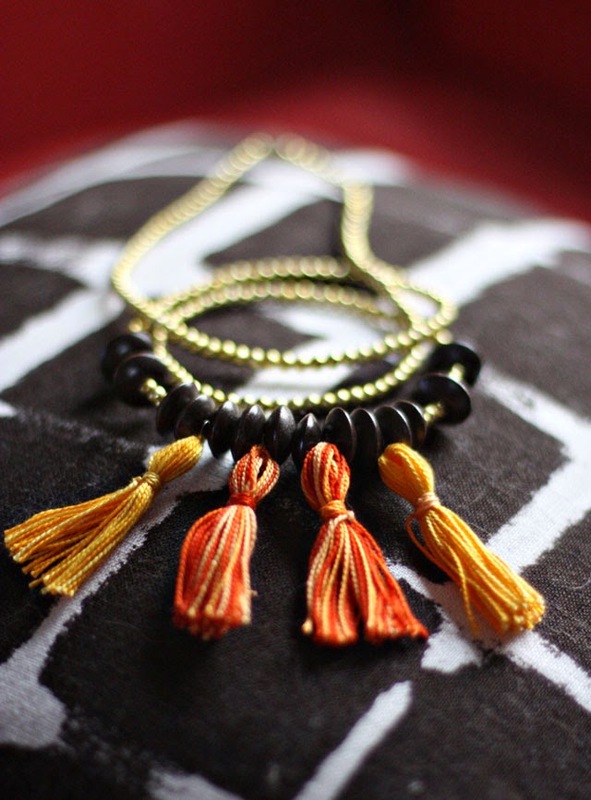 Speaking of tiny tassels…want to make something a little more high end? No problem. It’s easy to make and you can get all the supplies from Blitsy. Embroidery floss (one loop will make two small tassels), jewelry quality twine, large wooden beads, small metallic beads, O rings. How do you make two tassels out of one loop of embroidery floss? How do you make a necklace? 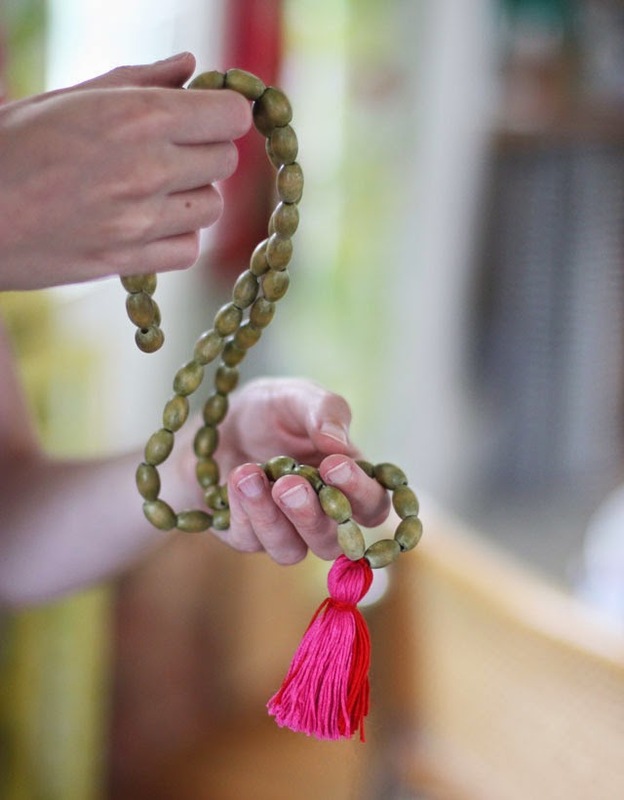 …then fill up the reminder of your strand with small beads and tie a secure knot. This is why I like making jewelry with twine – simple knots. No need to worry about fasteners or findings. Only thing you have to be careful about is that the hole in your small beads is large enough to thread twine. I’m crazy about the contrast between small metallic beads and big chunky wooden beads, but you can do all sorts of nifty things with just about any combination. 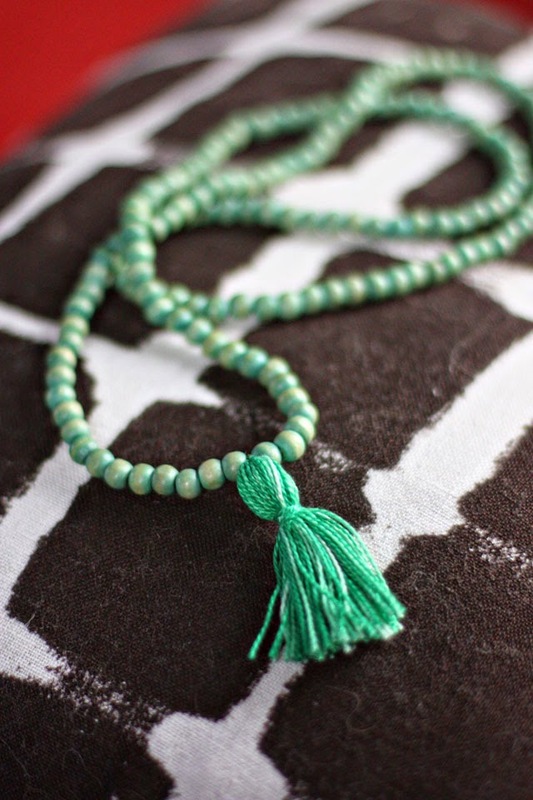 I’m thinking about revisiting this project with a whole hodgepodge of beads and tassel of varying sizes (stay tuned!) but I like the look of this one, especially paired next to a bold pattern fabric. Very Anthropologie. 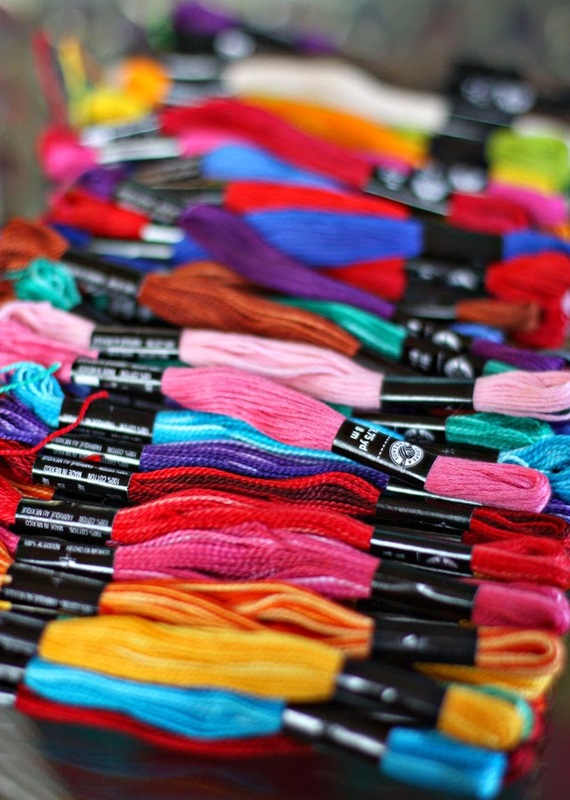 This post is sponsored by Blitsy, an awesome source for online jewelry making materials, as well a host of other craft supplies at discount prices (seriously y’all, they have some good deals). Drop by their website, or connect with them online: Facebook and Pinterest and Twitter.